Roland J. “Mac” McShanog, 90, of Savoy, Illinois passed away at 11:33a.m. on Friday, April 20, 2018 in his home. He was born on June 12, 1927 in Danville, the son of Lester E. and Simone (Stassart) McShanog. He married Marilyn Harmon on June 16, 195 in Taylorville. She preceded him in death on February 18, 2015. He was a World War II veteran of the US Navy and a member of VFW Post #4495 in Taylorville and the Champaign American Legion. 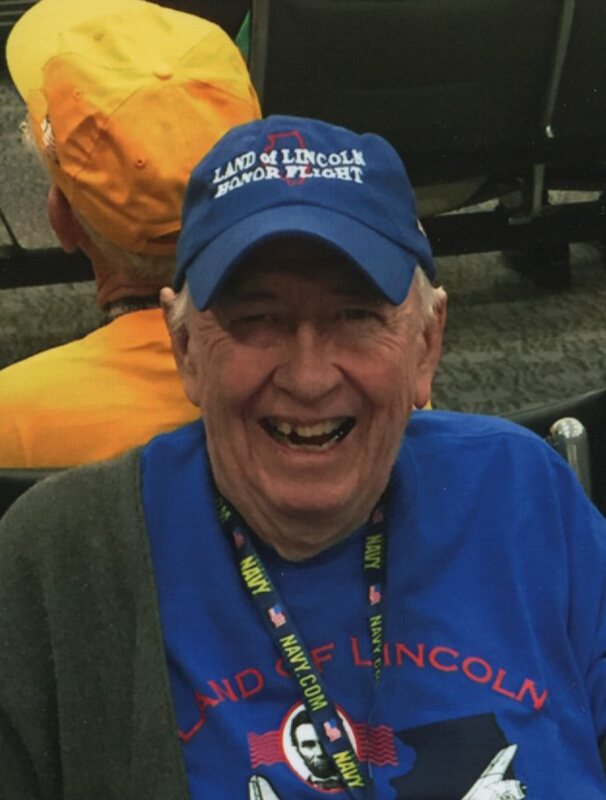 In 2015 Mr. McShanog, along with his close friend David Washington, was honored to take part in an Honor Flight to Washington D.C. to visit the war monuments. Following his time in the service, he graduated from the University of Illinois where he also was a member of the U of I Marching Band. Roland worked as a District Manager for the A.O. Smith Corporation. Following his retirement, he also worked as a professor of history in North Carolina. He was a life-long, avid, Chicago White Sox fan and enjoyed attending many games over the years. He also enjoyed spending time with his men’s group drinking coffee as well as sharing his talent of singing by entertaining residents at the local nursing home. He is survived by his sister: Virginia Foster of Watseka; nieces: Julie Ann Ladd (Larry) of Watseka and Mary Beth Firestone (Dix) of Dayton, Ohio; brothers-in-law and sisters-in-law: Norma Hubbartt of Taylorville, Ruth Garrett of Taylorville, Elmer Harmon of Taylorville, Charles “Chuck” Harmon (Gloria) of Springboro, Ohio, Bertha Hill of Taylorville and Donna Peters (Gene) of Taylorville; and close friends: David Washington (Amy) and their family of Rochester, Michigan and Charlotte of Savoy. His parents and wife preceded him in death. The funeral service for Roland will be held at 1:00p.m. on Friday, April 27, 2018 at McClure Funeral Home in Taylorville with Rev. Michael Evanchak officiating. Burial, with military honors, will be in the Oak Hill Cemetery in Taylorville. Visitation will be from 12noon until 1p.m. on Friday in the funeral home. Memories of Roland, or condolences to his family, may be left online at www.mcclurefuneralhome.com.